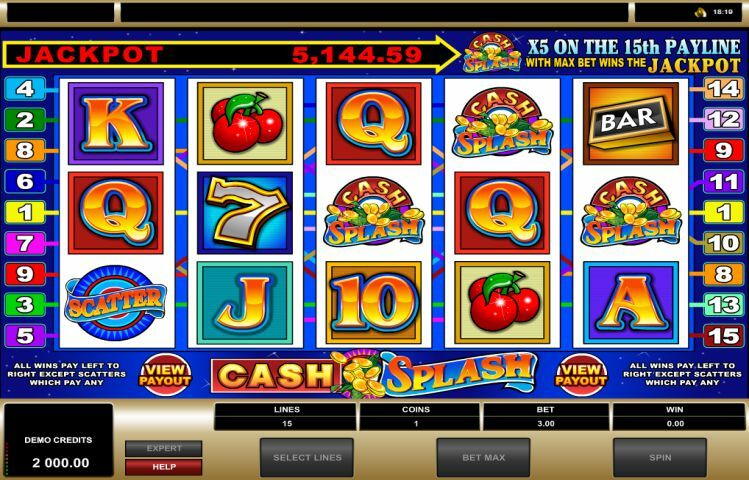 Thanks to the success of the Cash Splash 3-reel video slots game, Microgaming decided to follow it up with a fantastic sequel – the 5-reel, 15-payline Cash Splash Progressive. Combining traditional casino symbols and high value card symbols, Cash Splash also offers Auto Play in the Expert Mode, as well as bright, clean visuals and easy-to-use navigation. Best of all, it’s a progressive, which means each time someone bets and plays, a portion of that bet will go into the jackpot, thus increasing it until someone strikes it lucky and wins the whole amount. The coin denomination in Cash Splash is fixed at 0.20 and the betting range goes up till 3.00. In other words, it’s a practically priced game. The Cash Splash game icon is the Wild symbol, which means it can take the place of any other symbol to get you those winning combos. Well, any other symbol that is, except the Scatter. But back to that Cash Splash Wild symbol – land five of these on a max bet and you’ll score the big one in the form of the sought-after progressive jackpot. As for the Scatter symbol, which is quite simply a circle with the word “Scatter” draped across it, if it makes three or more appearances on the reels, you can score up to 250 times the wager you originally made. While the Wild and the Scatter symbols are the most important in the game, the other symbols include Dollar Bills, 7s, Bars, and Cherries – all classics – plus high value card symbols like A, K, Q, J, and 10. When it comes to the ever increasing jackpot, you can see its progress above the reels in the game. Cash Splash Progressive is an absolute winner of a game, and as a progressive jackpot slots game, it is also incredibly popular with players. After all, progressives are where the big money wins are at. Cash Splash is powered by one of the biggest casino software providers in the world, Microgaming. They’re renowned the world over for delivering first-rate graphics, audio, game play, audio, navigation, and winning opportunities. If that isn’t enticement enough, you can play Cash Splash at one of the leading online casinos in the world – the suitably named JackpotCity. JackpotCity was launched in 1998 and over the years it has accumulated more than 500 winning games, including plenty of great progressive slots titles like Cash Splash. It is licensed by the Lotteries and Gaming Authority of Malta and has approval from eCOGRA for fair game play, accountable casino behaviour, super-fast payouts, and 24/7 customer service. The minute you sign up and log in to play, you will become eligible for the welcome bonus up to 1600 credited across your first four deposits. The bonus magic doesn’t stop there – every day thereafter, you will also qualify for daily bonus deals and in-play rewards. To get in on the progressive action, simply register today and start playing!